Using NASA's Hubble Space Telescope, astronomers have conducted the first search for atmospheres around temperate, Earth-sized planets beyond our solar system and found indications that increase the chances of habitability on two exoplanets. Specifically, they discovered that the exoplanets TRAPPIST-1b and TRAPPIST-1c, approximately 40 light-years away, are unlikely to have puffy, hydrogen-dominated atmospheres usually found on gaseous worlds. The planets orbit a red dwarf star at least 500 million years old, in the constellation of Aquarius. 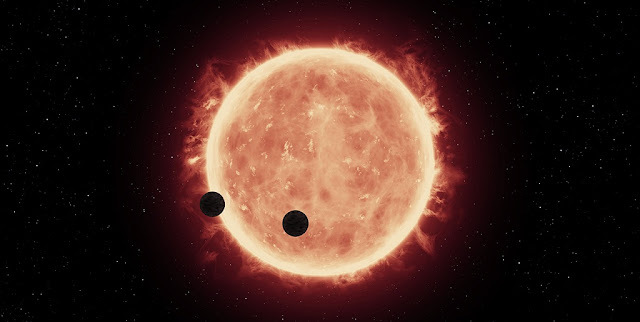 They were discovered in late 2015 through a series of observations by the TRAnsiting Planets and PlanetesImals Small Telescope (TRAPPIST), a Belgian robotic telescope located at the European Southern Observatory’s (ESO’s) La Silla Observatory in Chile. “A rocky surface is a great start for a habitable planet, but any life on the TRAPPIST-1 planets is likely to have a much harder time than life on Earth,” said Joanna Barstow, an astrophysicist at University College London, who was not involved with the research.